Old Guy kit: The original (left) and the second edition. Attention, DogMart shoppers! Today’s yellow-light special is … new Old Guy jerseys. I just got off the phone with one of the fine folks at Voler and we’re setting the wheels in motion, as it were. The general idea is that rather than do this the old-fashioned way — book a reservation date, set a production schedule, wait seven weeks to ship, etc., et al., and so on and so forth — we set up an on-demand deal that could have kit in your hot little hands in fairly short order. The op’ should be not unlike the one Drunkcyclist uses to get its kit to the people. I’m awaiting an email from the gent who makes all these Lycra dogs bark, so when I hear something, so will you. I’ll post an announcement on the DogPage and drop a permanent link into the sidebar at right. And thanks to everyone who kept pestering me on this. It sounds like a win-win for all concerned, save the poor sods who have to look at us wearing this stuff. This entry was posted on June 12, 2015 at 3:05 pm and is filed under Bidness, Bike stuff, Cartooning, Mad Dogs & Irishmen. You can follow any responses to this entry through the RSS 2.0 feed. You can leave a response, or trackback from your own site. Thank you! Thank you! Thank you! I guess this means I can removed the pins from the voodoo doll I have of you. You mean I’ll finally get to retire my Euro cut Zed jersey that’s now two sizes too small (for some inexplicable reason)? I asked Patrick at Interbike one year, why he even sold the jersey in small, medium or even large? They obviously are too small to join the fraternity. Oy. Euro cut. I got a couple of those I couldn’t get into without surgery. On me and the kit. Back when I worked in the “biz” I had a customer call it “the sausage cut”. It stuck. 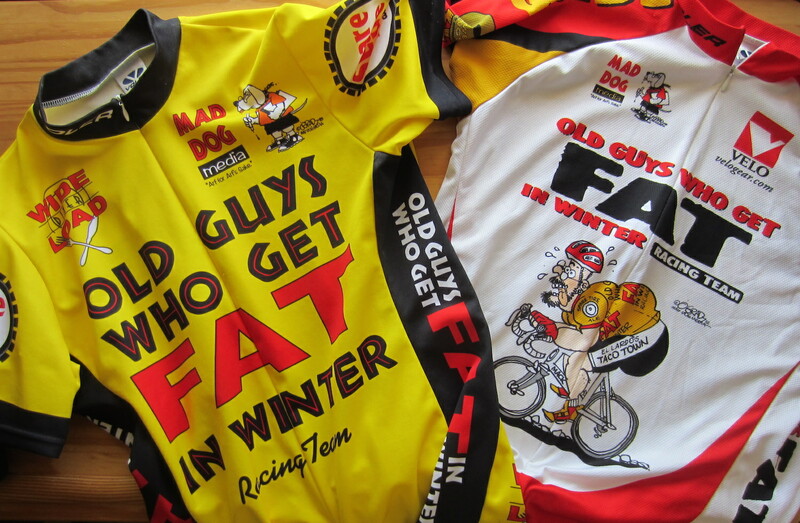 So I’m guessing my soon to be Old Guys Who Get Fat In Winter jersey will be tailored a bit more…relaxed? Thanks Bro! I am going old school with the yellow. Also, will let my LBS know about it. But, only after I order mine, of course. I think you have a pic of me in the first gen yellow jersey with a yellow C’Dale, a yellow helmet in a field of yellow Mexican sunflower. I wear Voler jerseys and road shorts exclusively. Great quality made in USA. Almost forgot: One year I did matching shorts. Don’t think I actually caused any car crashes, but I bet I scorched a few retinas. Training for these jerseys means heading to your local buffet to tank up and follow it with a 1/2 gallon of ice cream. Or a pint or two of Fat Tire, Guiness, or perhaps a Nooner pils. Or perhaps all of the above, Pat! What’s a shovel for then if not to lean upon? Why did the English invent the wheelbarrow? To teach the Irish to walk upright. One of my Irish ancesters had a comment written about him that he was “the first Irish male to die sober”. I had a friend who worked for the local county road department. I told him that some day I was going to put a kickstand on a shovel and put him out of work. Oh, and he was Irish. Count me in, Patrick. Also, when I get a new one, does the Old Town owner still need an original? I tried to get into my “small” yellow jersey today and it was mortifying. Almost thought of taking the 9mm hole punch to the brain….not really. My first gen yellow old guy jersey is long gone. Khal, relax bud, take two Blue Paddle pilsners tonight, three if necessary, and call me in the morning for further nutritional instructions. Khal, I have found that lycra is prone to serious shrinkage if left in a drawer too long. Woohoo! Thank you! Thank you! You have been busy! Love the art and the placement! I have one of each of those Jerseys, Pat. The nice part is that they are always conversation starters ! If you get no love, there is a place in Maryland that may be able to fulfill. C R Daniels in Ellicott City, MD that may be able to complete the task. They do an amazing array of metal and fabric work. Ask for Gary, and say that Dale from Worcester sent you (no secret knock is needed). I’ve been to Ellicot City a number of times. Used to have business trips to the Maritime Institute. I would go to Ellicot City for antique milk bottles, microbrews, and dinner. It reminded me of Bisbee, Arizona. Wahoo! I’m in, I’m in! Jerseys! Bib shorts if they’ll do them. Any options for vests? As for the sizing, if it’s for me, I’m with Russ for myself, but there are others on the Christmas list who are not as, ahem, generously proportioned as myself. This is great news. Have to say that I’ve gotten more comments on the “In dog years I’m dead” line on the MDM jersey than anything else. My Gen2 Fat Guy jersey is definitely worse for wear after a crash or two, great to have a new one in time for the Worlds. And, ya know, some El Lardo Taco Town bibs might be just the ticket too! I need at least one of these! Probably the yellow one… maybe one of each. I think I’ve seen Khal riding around displaying his. DownhillBill’s statement reminds me of timing. I’ll be in Richmond for worlds. I’m hoping to be able to get it in time. Oh goody. No more choriso cut jersey. This will be good.